Choose a sheltered, sunny site and ground that has had manure added during the winter or just before planting the beans out. A sheltered site will attract more bees to pollinate the flowers, leading to more beans. 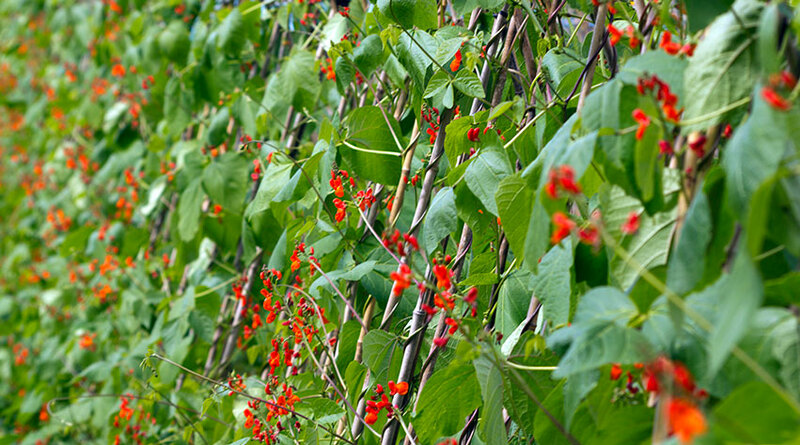 Sow your Runner Beans between April and June for the best results. Runner beans are usually grown on a ‘bean trench’ which is prepared by digging out the soil to a spade’s depth, filling the trench with farmyard manure or garden compost and back filling the soil over the top. The organic matter added to the soil will help retain moisture and cut down on the need for watering so often. Sow Runner beans later in the season as they prefer warmer weather. Sow directly into the ground in mid to late May or sow two seeds to a 9cm pot and keep under cover until they germinate. The seedlings can then be grown outside until they are large enough to plant out on the trench towards the end of May. Successional sowings can be made three weeks apart until the end of June but again, try to sow when the weather is warmer as plants may not crop before the first frosts. Ensuring the soil is constantly moist and doesn’t dry out will help to ensure that the flowers set and then create pods; so we recommend mulching the soil in June. It’s a good idea to mist the foliage and the flowers regularly, especially in hot and dry weather, as this will increase the humidity around the flowers and help to improve the flower set. Flower set is generally better in alkaline, chalky soils. You can consider adding lime to your soil if it is neutral or acidic. Runner beans like plenty of water especially when they begin to flower and form young beans. They should be watered regularly and fed with a liquid feed once a week once the flowers begin to set. Hand weed around the plants to prevent competition which will take the goodness from the soil. Give the plants adequate support with tall bamboo canes and pinch out the tips of the plants when they reach the top of the canes. Begin to pick the beans when they are on the small side and pick them regularly. Remove any oversized pods that have been missed from previous pickings and add them to the compost heap. You may want to snip the beans off with scissors to avoid damaging the rest of the flower cluster and any embryonic beans. If the beans do not snap cleanly in half, they will be ‘stringy’ and should be discarded. Slugs and snails love Runner beans so use your preferred method of control as soon as the seeds germinate and continue until the plants have finished cropping. Mildew can be a problem – this is usually due to dry conditions putting the plants under stress and is often seen towards the end of the cropping time. Aphids can be a problem too, which leads to few (or in some cases no) beans. Aphids are usually caused by lack of moisture or poor pollination by insects and can be avoided by planting in a sheltered site to attract bees for pollination as well as choosing an area that has plenty of organic matter in the soil.